Jan Richardson, Ph.D., a leading expert in guided reading, is a former K-12 teacher, reading specialist, Reading Recovery teacher leader, and staff developer. She currently is an educational consultant, providing presentations and classroom demonstrations across the U.S. and Canada. Below is a webinar on Guided Reading. 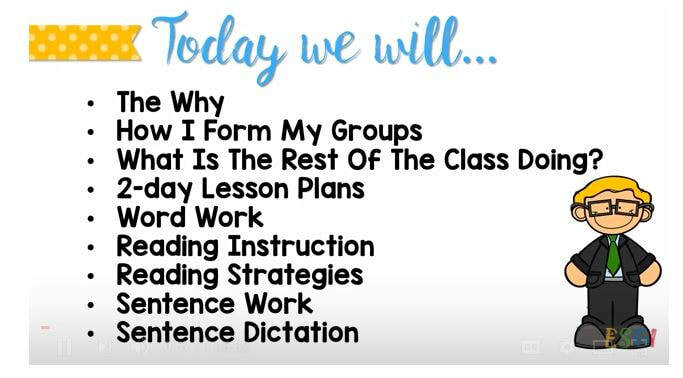 Below are some videos of teachers leading actual lessons using Guided Reading. ​These, in my opinion, provide a fairly realistic example of what lessons might look like in a real classroom. This teacher is using the Guided Reading examples by Jan Richardson.